Instead of all these anonymous comments, please email me at leonie@att.net; and I promise I will keep your name confidential. UPDATE: Jan. 15, 2011 - CONTACT LEONIE HAIMSON - THIS IS REALLY HER. New comment on your post "Do Not Apply"
I find it interesting that TAPCo was discussed on this forum. Somehow, the Theatre Arts Production Co. School was rated the number 1 school in the NYC-DOE report cards this past month. When the principal announced it, students fell over laughing. The reality is that Principal Passarella knows how to cook the books and play the system. I'm sure she's not the only one doing it, she's just the best at it. The report card grades various stages of academic progress ... such as the number of credits each grade student has obtained. - teachers are not allowed to fail students. No F's or 55's on report cards. Any 55 is changed to an NC (No Credit). Teachers are to give students EVERY opportunity to remove the NC ... such as copying work from friends, cheating, lying, etc. - teachers who do not comply and continue to fail students are terminated and removed from the school ... even if it's mid semester. Administration will just change the failing grades to passing ones. - students are also given bogus credits for classes they never took ... such as Phys Ed and Foreign Language. - most TAPCo students "earn" up to 14-16 credits a year, far above the 11 required for graduation. They are given full credit for taking an Arts class once a week, a Theatre class once a week, Phys Ed classes which don't exist, Foreign Language class once a week with a "phantom" teacher who is out on disability. - Regents passing grades are a joke as well ... especially in ELA and US/World History. The rubrics are vague, and the grading teachers give out 4's and 5's like candy. A cursory review of the essays indicate that most of these students can barely string together a legitimate sentence. Meanwhile, teachers are giving them 5's. - the latest insult to teachers is the development of the Inquiry Team ... or more-so, the Inquisition Team. This is a group of the principal's favorites who use their position on the team to intimidate other teachers. They are led by an angry, bitter little woman named Mrs. Acosta. Acosta does not teach any classes, but goes around criticizing people's classrooms. Her fake smile is very transparent. She has used her "power" against teachers who have spoken up against her or disagree with her. Her role is to report back to the principal any dissension among the teachers. - it's interesting how the number 1 school in the City has a teacher turnover rate of about 45%. Don't be surprised if that number is exceeded next year. But it's ok ... Principal Passarella knows there are plenty of teachers out there who will do anything and everything for a job. I just this evening picked up this story while browsing Norm Scott's Education Notes blog site (www.ednotesonline.blogspot.com); seems he picked it up from another blog called JD2718 (http://jd2718.wordpress.com ). It's not surprising, but it’s still truly a must read story for its explicit and detailed confirmation of what we all know is happening. My challenge to Cathie Black: THIS above is, by the "management system" you are inheriting from Joel Klein, the number-one-scoring (by inference, the best-achieving) high school in NYC. Although no one at Tweed will ever admit it, we all know that this sort of "playing the system" is rampant across the entire city system, and the report card system is worse than a joke, since some parents may actually believe it is legitimate. Given your extensive management skills and experience and your superstar reputation, not to mention your newly acquired, in-depth knowledge of schools and public education, WHAT ARE YOU GOING TO DO ABOUT THIS SCHOOL AND HOW ARE YOU GOING TO FIX THE UNDERLYING PROBLEMS CREATED BY YOUR PREDECESSOR'S FATALLY FLAWED "MANAGEMENT SYSTEM"? Check out the incredible testimonies given by parents and teachers at the No Waiver for Cathie Black Press Conference on Sunday, Nov 28 on the steps of Tweed. Lots of media coverage but they didn't share with the public most of what was said at the event. Waiver for Cathie Black Press Conference- More of what the media did not want you to see! As widely reported, yesterday Commissioner Steiner approved a waiver for Cathie Black, a magazine executive, to become our next Chancellor, despite a total lack of educational background or qualifications. 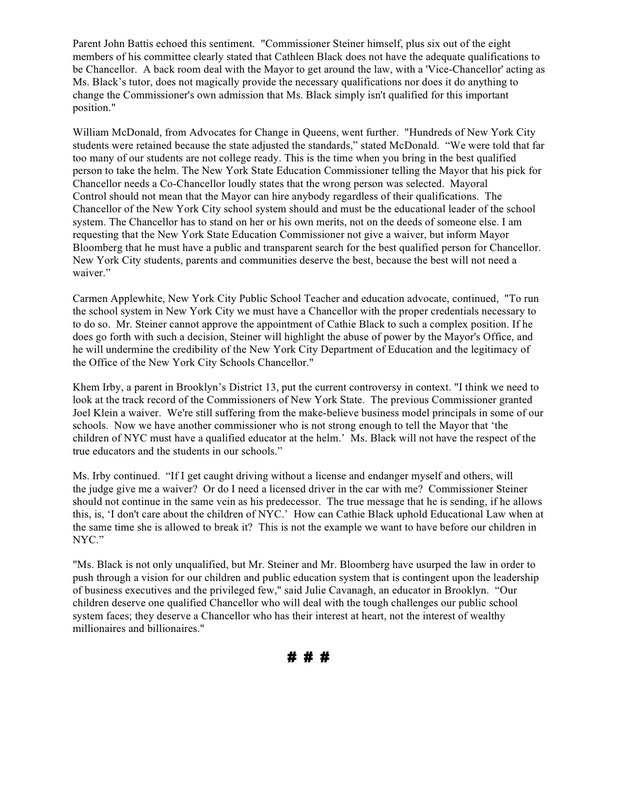 For more on this appointment, see our blog at http://nycpublicschoolparents.blogspot.com. For more on the approval, including the fact that the mayor has consistently overstepped the law when it comes to our schools, see today’s Times. What can we do? 1- Join the new Deny Waiver Facebook page, http://www.facebook.com/#!/pages/Deny-Waiver-Coalition/117396824992566 to keep up with the latest news and updates. 2- Join with parents across the city in the Deny Waiver Coalition on the steps of Tweed this Thursday, December 2, at 4 PM, and wear red to show your outrage. Post this event on your Facebook page and invite your friends and colleagues. We’ve had eight long years with our schools run by a non-educator. Class sizes have risen sharply, our children have lost art, music and science, test prep has replaced learning, and the results? Black and Hispanic students have fallen even further behind their peers in other large cities, and we are the only city in the country where non-poor students actually score worse on the national tests than in 2003. It’s time to start fighting back. Join on Thursday, and spread the word! Come wearing red, and don't forget to join our Facebook and Twitter causes and share the event with fellow supporters! Courtney Sales Ross' Robocall Warning of Anti-Charter School Attendees at Meeting. Ross' charter school was tossed out of Tweed and many consider it in the running for one of the worst schools in NYC with countless principals and other problems. There are stories that Ross is a pal of Joel Klein's wife. He authorized the opening of the school and it has been protected despite the poor results. Read Lisa Donlan's account of the meeting as it scrolls over Ross' call to parents to come out. The unconscionably unfair and undemocratic manner in which last night's public hearing on the Ross Global Academy Charter School charter renewal was conducted, has left grave doubts about the integrity of the DoE's charter renewal process. We have material evidence and 5 eye witness accounts that demonstrate the hearing protocol was not respected and that RGACS commandeered the public hearing to turn it into a pep rally and spectacle, rather than the somber review of the school's merit and progress that a charter renewal hearing is intended to be. The DoE hearing notice (below) made clear that speaker sign up was from 6:00- 6:30 pm, and the hearing would begin at 6:30pm. Yet the RGACS entrance was covered in signs that declared that the hearing doors opened at 4:30. Stationed at the entrance, RGA staff in "I Heart RGA" T-Shirts insisted that attendees sign in with them, and give over their personal contact information to RGACS staff. I refused to do so, stating that I would only sign in with the DoE as a speaker but the school principal harassed me until I signed in with RGACS. Thereafter, the RGACS staff began addressing me by name, and shadowing my movements, in an attempt to intimidate and dissuade me and other parents from participating in the public hearing. Most troubling was RGACS's bold act of overtly lining up their own speakers as early as 4:30 pm, such that by 5:30 pm there were more than 50 speakers, and by 5:45 there were well over 65 speakers in "line." RGACS staff also wrongly offered to collect written comments from speakers on their index cards. They told attendees that entering the auditorium would nullify their chance to speak, and that only lining up behind the 50 or so parents- to whom snacks, juice boxes and T-shirts had been provided- would allow an attendee an opportunity to speak. Furthermore, those of us who waited in the auditorium for DoE's arrival with the real sign up sheet were pushed aside by a gentleman from RGACS with a walkie talkie who blocked all access to the sign up sheet except for his group of 60 odd RGA supporters. Attendees that arrived at hte hearing shortly before 6 pm were thus placed in the mid to high 60th place on the speaker list, due to this subversion of the sign up process by RGACS. The DoE Charter School Office staff was duly informed of these antics and agreed they were unacceptable. However, the DoE employees refused to do anything to correct their own inability to manage the process, effectively handing over the hearing to the RGACS staff. At that point 6 of the non RGACS parents and electeds who had come to testify deemed the hearing a farce, and we chose to leave, rather than participate in a tainted hearing. It is interesting to note that the founder of RGACS, Ms. Courtney Sales Ross was allowed to speak first, and at length. while all other speakers were alloted 2 minutes apiece. Had we deemed to stay through the hearing, those of us with numbers in the high 60's would have had to wait another 2 1/2 hours or more, past 9 or 9:30 pm, in order to speak at a hearing we'd arrived at at 5:30 pm. I attach here the testimony I would have delivered on behalf of the CEC for District One, and am counting on all those copied here to please ensure that it is registered and duly recorded. I look forward to hearing back from all of you exactly the remedies and consequences you will prescribe to ensure that a democratic and safe hearing for this and all charter sitings, revisions and renewals will be the rule, as called for by law. Without your oversight and correction, the charter hearing process, and thus the results, are a mere sham. Smack yourselves in the head - more than once - after reading this - and look for our followup later on another scandal packed charter, Ross Global Charter. Cathie Black's placement on the board of Harlem Village Academy as a way to get her ed creds- despite the fact that she didn't attend any meetings, has focused attention on this scandalous school and its relation to the BloomKlein corrupt running of the NYCDOE. This Sept. 19, 2010 Ed Notes' report on Harlem Village Academy based on a surprising report in the NY Post received some notice. The Post article also references a 100% passing rate on the state math exam in 8th grade. In order to be promoted in middle school you must have an 80% in each class (I am not sure if this practice is legal.) A number of students that do not have an 80 in each class choose to leave the school rather than be held back or go to summer school. In fact DOE numbers show that they lose 32% of their students between 6th and 8th grades (See the link below.) Under standing their standards for promotion, it is easy to see that the 32% of students that leave are almost all the lowest performing students. If traditional public schools withheld students that got less than an 80 it would be easy to have high passing rates, but we would have to build 30% more schools. Essentially HVA dumps its lowest third of students back into public school system. My report also referenced a June 2010 Gotham School report by Kim Gittleson (who I got to meet at the Gotham School party 2 weeks ago). So, the scandalous story of HVA charter and its self-promoting leader Deborah Kerry who grows rich at public school expense, has been out there. As an Education Pioneer, Debra worked at Village Academies Network, a charter school management organization operating two schools in Harlem, New York. 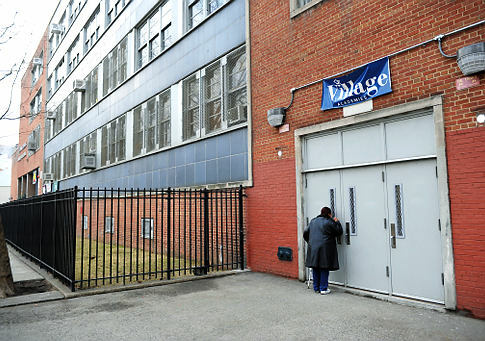 At Village Academies she was responsible for the relocation of Harlem Village Academy to a district space. She worked with contractors and vendors to negotiate purchasing and facility upgrades. She was also responsible for implementing the technology plan for the school which involved working with the e-rate program and various other vendors and stakeholders. She now works for the NYC Department of Education as Senior Director, Portfolio Planning. Another comment came from the inside apparently, even prompting an email from Diane Ravitch asking where I got the info. I could only say it was anonymous. This is a school with teachers turn over rate in the past three years 60%, 53%, and now 75%. This is a school where only 19 out of 66 students that started 5th grade graduated. This is a school where 62% of the students have been suspended. This is a school where if a student don't get 80% average, he is asked to repeat the class or attend a summer school, and if the average is less than 75%, the student repeat the class or leave the school. Even regents score has to be no less than 80% or the entire course is repeated. This is a school where students spend 10 hrs a day, and are punished for speaking in the hallways. Upon all these, our leaders are praising this school and even calling it the poster child school. Wake up people!!! Well, thanks to the Cathie Black story, people are looking at HVA. Another example of how Bloomberg even as he "wins" on Black, ultimately loses. Reality Based Educator at Pedido Street School picked up the story from the Daily News and I'll let him run with it. High rates of students left back or dropping out of the school, exceptionally high rates of suspension, high teacher turnover rate and low test scores. Gee, it sounds like a fabulous school and one we should certainly use as a model for education reform. And of course so many of the "celebrities" in the education reform world have stated it is just that - from Bill Cosby to John Legend to Bob Herbert to Tiki Barber to unfortunately the most powerful ed deform celebrity of all - Barack Obama. But the reality that underlies the hype is that Harlem Village Academies is no miracle shop and the people running it are no miracle workers. I think that RBE pretty much sums this one up. If the UFT didn't have 2 charters that invaded public school space, they might actually spend some time exposing this junk. TVCoverage of today's news conference. Lead story on New York 1 this eve. With research showing that the most important factor in the success of a football team being the quarterback and with so many NFL teams showing poor performance - the achievement gap between the Washington Redskins and the New England Patriots has not only not been narrowed, but has actually widened - Teach for America founder Wendy Kopp has come up with a plan to close the gap and improve performance throughout the NFL by starting a program to train NFL quarterbacks. The new program will be modeled on her brainchild, Teach for America and will be known as Quarterbacks for America, or QFA. 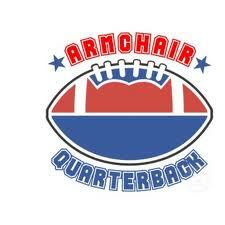 "We know that the success of teams depends on the quarterback. Did you know that the majority of NFL QBs rate in the bottom third of their class, as opposed to places like Finland where their quarterbacks come from the top quartile," said a spokesperson? "We intend to reverse that trend by recruiting from only Ivy League colleges. Naturally we prefer people who have never played football since it is so obvious the college training schools have done such a poor job." All those chosen will be given a 6 week summer crash course in quarterbacking before being sent off to lead NFL teams. A lot of people have been using this Xtranormal video robotic like tool to create videos related to the educational insanity. We need a few about the UFT. These videos of a meeting between a teacher and an Ed Deform inspired data munching principal are so right on. They were done by a NYC teacher. The best part? His principal was the one who sent them to me. I thought you might enjoy these two XTRANORMAL MOVIES I made. They are, in the interest of humor, exaggerations of the truth. Of course, there is a grain of truth in all good parody. I believe that there are more than a few schools where these little films would not be an exaggeration at all. My parody might even be understated compared to what goes on in some schools. I am fortunate that in my school we have not reached this stage of insanity, but we can feel the pressure to which our principal is always being subjected. We just hope that things change and we get some educators into the leadership before the pressure becomes irresistible. This may be funny now, but the stakes are high and if things continue as they are, it will no longer be funny. The Sunday Times book review section review "Shock of Gray" a book about the aging world population, posing the issue of older people vs. younger people for jobs in addition to the fact that as birth rates drop there are fewer workers to support the elderly. What is of interest to us is when the author, Ted C. Fishman, refers to "age arbitrage" where companies trade in their older employees for a younger, cheaper work force elsewhere - outsourcing - attributing this to globalization. This got me to thinking about what we've seen here in NYC within the teaching ranks and the growing assaults on senior, higher paid teachers. 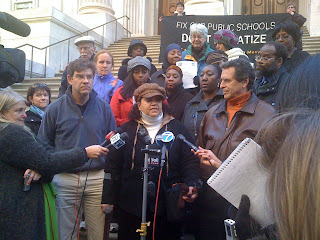 First we saw Joel Klein claim early in his tenure that seniority was harming poor kids because the most experienced teachers could transfer out to better neighborhoods while at the same time attacking senior teachers by claiming the very same seniority transfers were foisting incompetent teachers on principals. He also attacked the "bumping" rules where senior teachers had the right to bump junior teachers within the same license area. The 2005v contract killed these seniority rules and created a pool of ATRs, the use of these senior teachers as short term of long term subs. Then Klein implemented what he called fair school funding, where for the first time a school was charged for the costs of the teaching staff. Thus, a school with a lot of teachers with over 22 years making a hundred thousand a year (by the way, giving big raises at the top was part of the long-term plan- call it an investment - to create such a gap in salary between new and senior teachers as to start the pressure cooker boiling) could afford less teachers, thus giving principals an incentive to go after the higher salaried teachers. Lest you doubt the triage metaphor, consider Vicki Phillips' recent remarks to the National PTA. 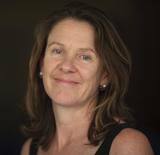 Phillips is the Education Director for the Bill & Melinda Gates Foundation. So we know master's degrees have almost no value. We know certifications don't make a difference. We know that after three years, seniority doesn’t really matter . . . After year three, teachers usually don't get significantly better or worse. So you see where this is going. Degrade the profession, use more TFA temps, etc. By increasing non-unionized charters - pay the salaries to make them competitive with the public schools but demand 30% more work, no pensions and possibly lousier health plans - they ultimately will be able to drive down every one's salary so one day we are back to the 50's, with a basic non-unionized work force making peanuts and with lousy working conditions. The next step will be to demand that when layoffs come, seniority be thrown out - this will be a focus for Cathie Black. Part of their game plan it so appeal to the newer, younger teachers who will demand they be kept on while older higher salaried teachers are let go. Watch the value-added scores be released just in time - can't you see a list in the NY Post of every teacher making a high salary and their value-added score compared to lower salaried teachers in their school? That's coming folks, to a school near you. 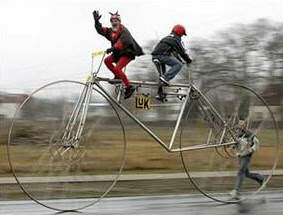 Should see this picture for teachers within the context of Fishman's book, as part of a worldwide trend? Or is this a unique case? For those of you who thought of Joel Klein as incompetent - with his multiple reorganizations and all the other hazarai, I disagree. His job was not to improve education or even about education. It was about ideology and to do what I described above. In the latter he was brilliant - a master, especially with a cooperative UFT - non incompetent either by the way, as solidfying and holding on to power is the prime directive and they have done that as well as Klein has done his work. Yes, I attacked David Steiner the day he was appointed by Merryl Tisch. I was criticized for not giving the guy a chance. My response was that I did not need to know a thing about him. I knew who chose him and that was enough. We live in the DiMedici era where patrons determine everything and scholars owe allegiance to their patrons, not to the truth or a moral vision. Ed Notes has learned that the NY Mets were set to appoint Cathie Black as their new general manager instead of Sandy Alderson a few weeks ago but Mike Bloomberg, having already decided to kick Joel Klein to the Rupert Murdoch curb (where Klein is predicted to last about a year before claiming he wants to go back into education destruction), intervened. A spokesperson for the Wilpon family would not speak on the record but endorsed Bloomberg's vision of corporate manager not needing to know anything about the area they are managing. "Look at our results over the past few years," he said. "Worse than the results of the school system. And with people supposedly having baseball knowledge. So we decided to hire Cathie Black to reverse the fortunes of the Mets but Bloomberg said she knew even less about public schools and education than baseball and he needed someone to chop the school system down into little morsels and that could best be accomplished by someone who knew nothing about what she was chopping. Too bad. We could really use a 50% cut in the Mets payroll." In other news, Rupert Murdoch has announced that for the brief time Joel Klein will spend at the News Corp, he expects Klein to reorganize whatever division he heads at least once a month with the goal of breaking the Guiness Book of World Records for reorganizations, a record currently held by Klein himself. There are increasing calls for to take action. The overwhelming majority of teachers have been missing in action as the assault continues with the Cathie Black appointment. What will it take? Maybe experiencing Cathie Black's upcoming assault on teacher seniority. Do you think Black and Bloom have any intention of laying off teachers based on last in? Watch the assault with Cuomo as their ally arguing that by they can get twice as many teachers by getting rid of teachers who make more money - especially ATRs. Some think the union will hold the line. Do you? What if B&B ignore all the rules and dare the UFT to do something about it? Would the UFT strike? You know they won't. So it's off to court while thousands wait without pay checks. Outside the realm of possibility? I read Susan's speech last night, soon after hearing of the sham going down with Shael and Cathie. Here is her speech to the National Council of Teachers of English, an org that Susan has been critical of for cowtowing to the ed deformers. Teachers - heed this call to action. As you see every day, the UFT/AFT is in bed with the deformers. In Homegrown Democrat, Garrison Keillor warns, "When you wage war on the public schools, you're attacking the mortar that holds the community together. You're not a conservative, you're a vandal." Part of education in the Global Economy. As Richard Allington observed in Big Brother and the National Reading Curriculum, "What seems to be under way is an attempt to portray teaching as a blue-collar job: No special skills are needed. Heck, even intellectual capacity doesn't really matter! Teacher education is portrayed as unnecessary--and even damaging." Bill Gates and Arne Duncan & Barack Obama and the Business Roundtable are systematically destroying the profession of teaching, and our professional organization must help us stand up for who we are. Duncan and Gates are wrong: The 'best and the brightest' are not the people we need in our schools: We need the savvy, rock steady, dependable, loving, forgiving people who have an enormous capacity for wait time and the psychological equilibrium to be able to enter the classroom every day not holding a grudge for what happened the day before. Consider how Secretary of Education Arne Duncan's remarks echo those of the Gates Foundation officer. There is no hope left for achieving significant reform or restoring our democracy through established mechanisms of power. We must take to the streets, armed with the tiny acts of truth and kindness that throughout history have exposed the oppressor’s cruelty. 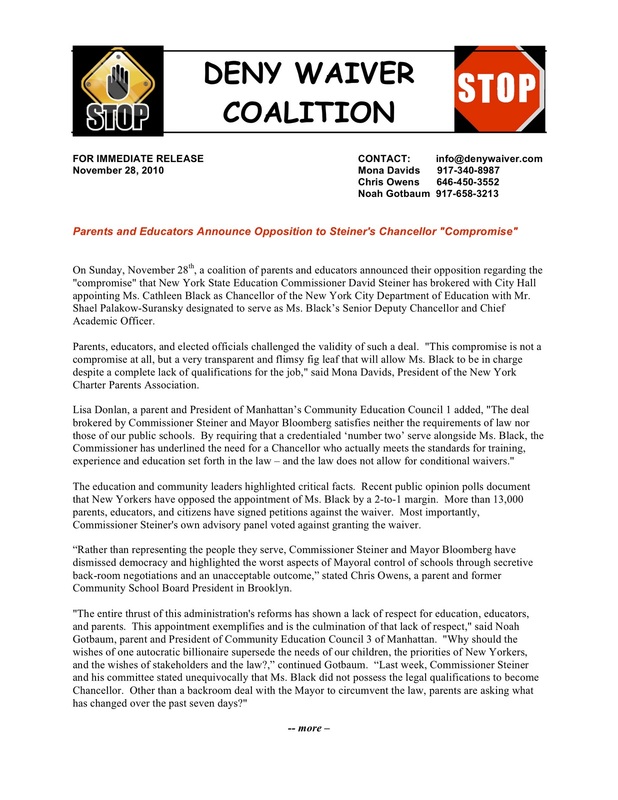 Even though his own board voted against granting Cathie Black the waiver (needed for her lack of any education credentials -- not to speak of teaching experience) and against Steiner's suggested face-saving compromise, NY State Education Commissioner David Steiner has caved in, from our viewpoint, and agreed, as expected, to that compromise. Knowing Bloomberg, this will be a farcical whitewash. All the power will reside in Ms.Black's and ultimately Bloomberg's hands. But that is what the union agreed to when it backed myoral control. Now, if the system crashes even further, or is purposely dismembered, as has been taking place, we can blame the mayor. But where does that leave the teachers and their students? And you know that the dismemberment will be portrayed as a heroic success, by almost all the politicians and media (from Obama to John Boehner at the national level, and from the Times to the Post locally). Why would a union (and its members) participate actively in union busting? What is the rationale? I'm sure they have one. But it's beyond simple folks like me. Ultimately, we, the teachers, are responsible for this. We spoke with our votes at each step. The carrot and the stick succeeded. And it will again. Forever on the defensive. Forever facilitating the obscene by invoking fear of even greater obscenities. "Be thankful it wasn't Rhee. And look, we won. Bloomberg backed down. Now she knows she will have to work with us." Let's pray that sense will ultimately prevail. But one is less and less hopeful. So was my own country of birth conquered and colonized, by wave after wave of invaders, from the Arya to the Afghans and Turko-Mongols to the British, even as most of our great landlord-kings (the Rajahs and Maharajahs and later the Nawabs and Sultans) collaborated. How Many Feel the Shame? He'd rather bend than stand. Our union will follow suit. From whip and binding tether. They too, must orders parrot. And make believe it's heaven. They'll hardly shed a tear. Wear shorts and matching tie!" "Why must you question why?" Will hint at orders worse! Was grab the highest place. As they had always been. And yet, all stays the same. While others feel the shame. This day is called "Black Friday"
This day for profit's cause. Who's made this Friday black. And never douse the flame. Can never do the job. Or yield to waiting mob. Wow! Is the NY Times beginning to get it or what? 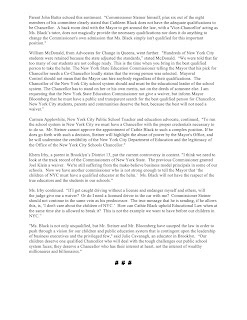 When the first sentence of an article (Discontent With Mayor at Heart of School Uproar) about the resistance to the Cathie Black nomination in today's paper by Elissa Gutman quotes Lisa Donlan, you know BloomBlackKlein are wearing out their welcome as arbiters of the NYC school system. Now for those of you who don't know Lisa, she has been one of the leading voices out there battling Mayoral control, the DOE and charter school invasions on the Lower East Side, where she is president of Community Education Council (CEC) 1. The CEC's are the sort of powerless replacements for the 32 old district community school boards which served students from grades k-8. There are separate councils for high schools and special ed. Many of the most people involved at these councils have met and become active through the NYCEducationNews listserve started by Leonie Haimson of Class Size Matters. By the way, if you had an idiot relative try to tell you at Thanksgiving dinner that class size is only about teacher unions trying to create jobs and has nothing to do with learning, send them to the research on Leonie's site. It was this group of activists that held the press conference last Monday at State Ed Commissioner David Steiner's apartment. You can see this entire group of amazing parent activists in action in the video I put together of the press conference, a video that is a must see if you want to get a sense of what is underlying the increasing resistance to Black and Bloom. I'm including that video below - only 5 minutes but well worth your time. My favorite part: when Lisa thanks Bloomberg for the appointment of Black "for putting the final nail in the coffin of mayoral control," followed by CEC3 President Noah Gotbaum's "Mayoral control is out of control." 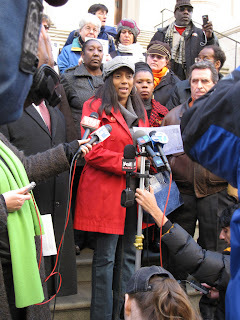 Lisa has been a major ally of the corresponding teacher activists and has become a very good personal friend. Her defense of the kind of schools she and others helped advocate for on the Lower East Side in District 1 over the decade BEFORE BloomKlein took over is eloquent. I have a great unpublished video interview I did with her a year and a half ago talking about those years - where District 1 schools were diversified and parents did have school choice, a demonstration that public schools could be given choice within the public school system but that system was intentionally destroyed by BloomKlein so as to make it look like privatized charters were the only option - their version of The Shock Doctrine. I haven't put it up because whenever I try to edit it into 10 minutes to fit on you tube I find there is little I can cut. I may just put up the entire interview on Vimeo as one of the best arguments against charters and mayoral control. I would have hoped that the Times would address this issue Lisa has raised repeatedly. Lisa is famous for the puppet show she did with Jane Hirschmann at the historic Jan. 26, 2010 PEP meeting at Brooklyn Tech. She is also a charter member of the Real Reformers. Here is the link to the press conference on Monday if it plays too slow in this window. How nice of Evan and Sydney, who left teaching, to take money out of their pockets and offer you all a nice school party. And WOW! Become an E4E school capitano. Get all your colleagues to call for pay based on your students' test scores and get them to back Black&Bloom when they lay off thousands of teachers to keep the newest/cheapest ones and get rid of those high priced senior teachers. What they are not telling you is that their happy hours are like those free trips to resorts where they lock you in a room for hours and you have to listen to the schpiel. Happy Turkey Day! Enjoy the much-deserved time off! But before you doze off into your food coma...check out this week's latest in education! The drama over NYC's next schools chancellor took another turn last night. Although David Steiner, the New York State Education Commissioner, has final say in deciding whether or not Cathie Black receives the necessary waiver, four out of the eight members on his advisory panel recommended to not grant this waiver. 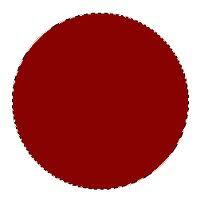 Two others voted in favor of granting the waiver and the remaining two members voted to not grant it at this time. The Wall Street Journal covers this story and Commissioner Steiner's possible compromise of co-chancellors. The New York Times reports that Mayor Bloomberg announced initial plans to cut 10,000 teachers and other city employees to balance the budget over the next two years. Arne Duncan, US Secretary of Education, gave a speech (pdf) at the American Enterprise Institute (AEI) forum, explaining that schools will need to make hard choices in the future. Schools will need to think differently about things like, "seat time, class size, and teacher pay scales." Rick Hess explains his amazement with this speech in his Education Week Blog. Arne Duncan also gave a powerful interview with the Wall Street Journal's Rebecca Blumenstein about how to fix America's education system. The New York Times covers the difficulty that some failing schools are having in turning around their achievement because of decreasing enrollments in a profile of Paderewski Elementary School in Chicago. Want E4E to Throw a FREE Happy Hour For Your School?!?! E-mail Ryan Black, our Outreach Director, at rblack@educators4excellence.org with your name, the name and location of your school, and approximately how many staff members and we'll set it up! Tell your friends and colleagues about E4E to make sure the voices of all teachers are being heard and the needs of our students are being put first! Apply to become an E4E School Captain! Share E4E with your school! We are looking for a group of motivated individuals who are interested in becoming E4E School Captains! As a School Captain, you will have the opportunity to host E4E-sponsored events for your school, get your friends and colleagues involved, and have the chance to tie policy together with practice within your own school! Parker's Last Acts Of Desperation - Happy Thanksgiving! 6 Days To WTU Run-off Election- Didn't get a ballot call 1-800-273-0726 to get a duplicate.